Family, friends and Bermuda Fire & Rescue Service coworkers gathered at First Church of God on North Shore to pay respects and celebrate the life of the fire fighter. 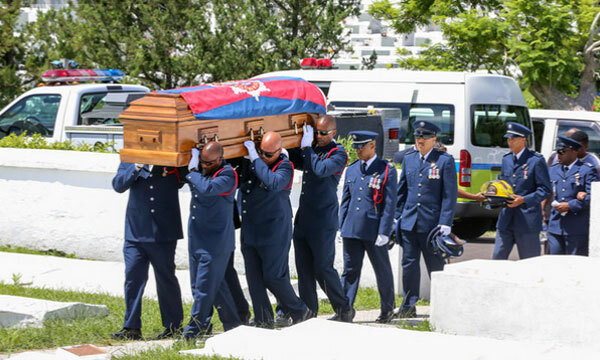 Escorted by police, the procession — which included a large contingent of Fire Service vehicles and personnel — left the church with Mr Smith’s casket draped in a flag and carried on the back of a fire truck. As the group proceeded to Hamilton they were met along the way by members of the Bermuda Police Service showing their respect at the Hamilton Police Station. The motorcade drove by the Hamilton Fire Station where vehicles were lined in front of the building and staff stood to attention offering their last goodbye. A BFRS spokesperson previously said, “FF Smith joined the Service on February 22nd, 1999. He successfully completed an intensive 22 week Recruit Course; both locally and overseas at the Fire Service College located in the United Kingdom. “During this period, he obtained his Emergency Medical Technician – Basic qualification [EMT-B], along with other Firefighter qualifications. After his Recruits Course, he was assigned to Crew One of the Operations Division. “On June 4th, 2000, the crew along with FF Smith was required to respond to a head-on Road Traffic Collision [RTC] involving two cars. “January 9, 2005, FF Smith was transferred to Crew Two within the same Division. Because of his “light-spirit” and friendly personality, he quickly formed friendships that he maintained until his untimely passing. “On June 22, 2009, FF Smith received a Letter of Recognition from the former Chief Fire Officer [CFO], Mr. Vincent Hollinsid, regarding a medical emergency he had attended and were he provided exemplary service; to which the patient expressed their gratitude. “Mr. Hollinsid stated in his letter, “The professional and highly skilled manner in which you treated the patient is to be commended…” FF Smith thrived on performing at a high standard and representing BFRS well. “On April 23rd, 2010, FF Smith successfully completed the Fire Service Pump Operator Course, which allowed him to operate Fire Appliance pumps during fire ground operations. Wishing to expand his skills, he completed the Fire Service Emergency Driving Course, which allowed him to operate as a frontline emergency driver. “After spending several years on Crew Two, FF Smith was then transferred to his original crew where he began his Firefighter career [Crew One] on March 3rd, 2013. Around the same time, FF Smith began a regimen to improve his Physical Fitness and overall well-being, as the job can be very demanding on the body. “Consequently, he took a serious liking to jogging for general exercise [and entered several local races]. As a result, his efforts did not go unnoticed. CFO, Mr. Reginald Burchall expressed kind sentiments commending him for his commitment. “January 1, 2015, BFRS began transporting patients from the Eastern Parishes to the hospital via the department’s ambulance. Due to FF Smith’s efficient EMT-I skills and excellent “bedside manner”, he was selected as one of the Firefighter/EMTs assigned to the Clearwater Station for the initial launch. “Shortly thereafter, he recertified his EMT-I qualification that same month. FF Smith thoroughly enjoyed working for the Service and his passion without a doubt was the EMS side of the Service. “This was evident as FF Smith indicated on his last performance appraisal his desire to become a Paramedic as one of his objectives/goals for this year. FF Smith was in the infancy stages of seeking the appropriate schooling to fulfill this dream. “In summary, FF Smith was an energetic and easy to work with brother who was well liked and will be sorely missed by his BFRS family”.